The NGV International has a new kids area called Kids Space and there are also kids trails here where your child/children can go hunting around the art exhibits. The Kids Space is for children up to 8 years old to discover art, play multi-media and do some hands-on activities. To do the kids trails, you can get booklets which have questions about some of the art and lists of things for the children to find in paintings etc. They also have pages to colour in. Just go to the information desk, choose a trail, pick up the booklet and off you go - it's as easy as that! ........These trails should keep the kids occupied for quite a while. The trails change periodically so they'll often be new things to find and do. 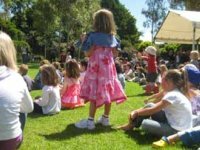 .........and don't miss the back garden, it's great for kids with lots of room to play, picnic areas and a really good climbing frame. 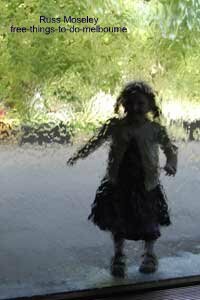 You'll find a waterwall too which kids find fun - see photo at top! It keeps adults entertained too! This is at the front entrance of the NGV. 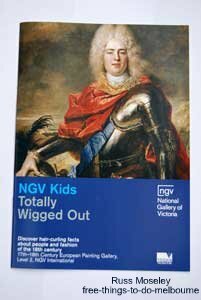 Click on NGV Kids for updated info. 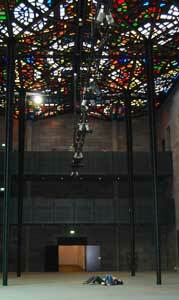 The International section of the NGV is located at 180 St Kilda Road, just past the Arts Centre spire. It's open 10am - 5pm daily except Christmas day.